After being awarded a research bursary from SELA during summer 2016, I had the opportunity to explore a new field of my own choice. Given the challenges faced on the offshore wind energy industry, and the opportunity to have a positive impact in society and the environment, I chose to focus my research on improving the design of wind turbine foundations. The offshore renewable energy industry has a major role in reducing greenhouse emissions and securing the energy needs of future generations. 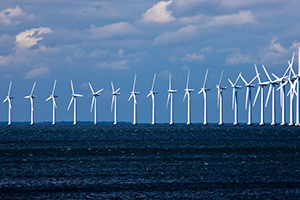 On 13 April DONG Energy, the world leading offshore wind farm developer, announced the construction of three new offshore wind farms in German waters. Two of these projects were awarded at a ‘zero bid’, which means that they won’t receive any subsidies from the Government to generate electricity. This is a major breakthrough, not only for the renewables industry but, for the entire energy industry, which is heavily subsidised. Germany alone, invested €2.2 billion in subsidising fossil fuels and €20 billion in renewable energy in 2013-14. Shifting to a low-carbon economy has proven to have great benefits for the economy on a short term. However, these two projects will be profitable only if the costs continue to be reduced throughout the next decade. In order to do so, many research projects are being carried out to improve designs, efficiency and installation methods within many other areas of the business. I chose to focus my research on new designs that have the potential to reduce costs. More specifically, I studied the behaviour of rough steel piles, which may behave differently than smooth steel piles. Rough surfaces are known to increase friction forces, therefore the shaft resistance of the pile under horizontal loads is expected to exceed the one from smooth piles. The aim of my research was to measure the increased resistance to horizontal loads of rough piles in comparison to smooth ones. Current design codes state that the pile roughness is not taken into account when designing wind turbines. Therefore, the ultimate objective is to understand the behaviour of rough piles and aid engineers with the process of designing cheaper wind turbines. Given the time constraints and the complexity of the project, I focused on obtaining initial data, which will determine the potential of reducing costs. I recently got into the lab to continue conducting physical tests with a scaled model as part of my dissertation, which will be published at the end of June. Being a member of SELA has given me the opportunity to develop a deep understanding of the particular industry that I wish to work in. Throughout this project I have been able to explore how the industry operates and understand the major challenges faced. Not only the technical challenges, such as handling large diameter piles on the harsh marine environment, but also the financial and political ones, which are just as difficult to address. I hope that this project will lead me to find a role in the offshore renewable energy industry, where I can have a positive impact in society and the environment.